ShareChat is a first of its kind regional language social networking platform, focused completely on India. We have been downloaded more than 3 croretimes, and are available in 10 languages, namely, Hindi, Malayalam, Gujarati, Marathi, Punjabi, Telugu, Tamil, Bengali, Kannada, and Odia. What started as a niche idea just 2 years ago now have over 2 million active users and over 5 million unique eyeballs every month. Last month, the posts shared from ShareChat to Whatsapp grabbed around 100 Crore(1 Billion) eyeballs. While other global Social Media Platforms cater to audience having knowledge of English, the everyday Hindi user in India, finds it a tad difficult to express himself in a language which is not his mother tongue. It is only on ShareChat that he finds a voice where he can not only express himself but also which resonates with over 4 million users like him. Social Media, which was until now a fiefdom of the urbanites where the chatter was started by the well versed and ended with Shenanigans of the well connected has found a new hope, which gives voice to the voiceless and is successful in picking the ground trends and helping the users connect with those who matter. While there are many things which can arouse a curious discussion in India, there is nothing which sets the tongue wagging as much as politics which is keenly discussed and opinionated upon in every nook and corner of the Hindi heartland. With the UP elections going on, there is no better setup than a lively discussion on a platform as open as ShareChat. For the special purpose of catering to the UP audience in which elections were being held, we had made special tags, in which users could post their texts/images/audios/videos and others could like, share or comment on those posts. Each party had a special tag, thus creating 4 tags vis a vis BJP, SP, BSP, Congress. Also there were 2 general tags, “Man se Matdan” for motivating voters and “UP Election” for general election news. We hereby showcase the various insightful data points and graphs spanning across every party that was in fray and how the masses who were till now voiceless have not only got a voice but are diverse in their opinions but united by the common dream of a better future. We got a staggerring 15.2k posts in the last 30 days, which in total were shared over 321k times on WhatsApp, a platform which even further amplifies the message of the masses originating from ShareChat.These posts were created by 6k unique users, translating to 2.54 posts per users on an average in respect to 4 different parties, vis a vis BJP, SP, BSP, Congress. It is noteworthy that there were no recognized digital campaigns run by political parties, and all opinions were of the common man. While the number of views each tag received was humongous both in ShareChat and on Whatsapp, the following 2 graphs shows the views each party’s posts received on both platforms, and the likes and shares for each party’s posts. As has been seen in India, time and again, there isn’t a single voice in which all people speak, and each has his/her own preferences. The following graph shows the positive/negative voices emerging from the people regarding different political parties. One peculiar point from the above graph is the fact onto how the BSP as a party is shielded from criticism, having almost no criticism, while Congress is prone to huge criticism from the people on the ground. This is almost identical to the on-ground reality where no major leader attacks BSP, the way they generally attack other parties. This however does not correspond to more favour for a party, as it is seen that BJP leads the pack in the number of people supporting it, while Congress has the most people opposing it. Also, to view the content related to different political parties, the ‘BJP’ tag was opened 84.6k times, ‘SP’ 27.4k times, ‘BSP’ 21k times and ‘Congress’ 15.7k times, thereby giving an indication about the interests of people in different parties in this election season. To monitor the popularity of each party and how it is changing with each passing day, we created a Popularity Index based on the Likes,Shares and Comments on the posts of the parties on that particular day. The following graph shows the popularity of different parties with time on ShareChat. The elections in UP were held on 11,15 and 19 February, and for each of these days there is a relative peak(local maxima) occurring for almost every party with varying degree of slopes, thus again relaying the fact that the discussions, popularity and interest of people surrounding a political party considerably increase on the election day. The following graph shows the number of times the leaders were mentioned positively/negatively in the most viral posts. 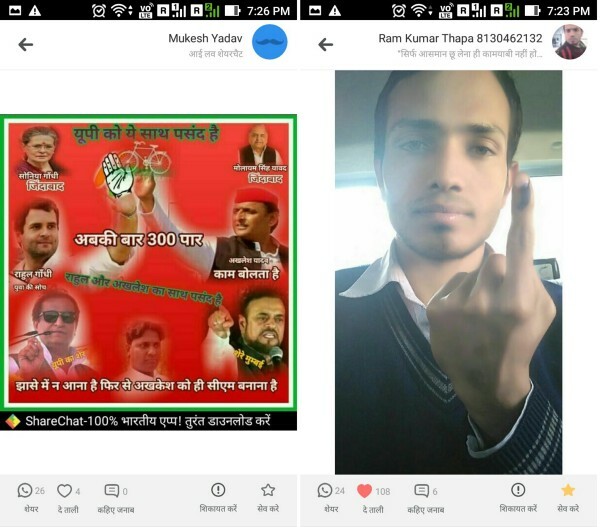 To create awareness for people to vote on election days, a special “Man Se Matdan” campaign was run by ShareChat asking users to vote on the election day without the influence of drugs, money or fear. 1.5k posts were created under this tag spreading awareness around importance of voting. These posts were shared over 24k times on Whatsapp catering to a total of 1 million eyeballs. 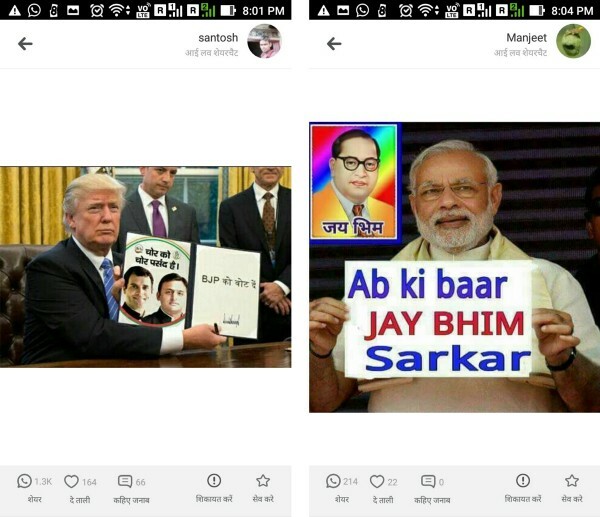 People posted a variety of content including but not limited to posters, memes, jokes, sarcasm, poems, posters of local leaders contesting in the elections, historical facts, videos, audio songs, slogans, selfies after voting etc. There were also creative campaigns in favour of SP, wherein they used audio songs in local dialects, that appealed to a lot of people. There was also a peculiar post in which American President Trump was seen asking his sympathizers to vote for him. Rather awkwardly, out of 11 most famous posts of BSP, 3 were those in which they had used morphed images of PM Modi, wherein he seemed to be campaigning for BSP, asking voters to vote for “Behen Mayawati”. The above data and analysis clearly shows how ShareChat is evolving as a platform giving an impartial avenue for free expression, capturing ground sentiments and playing its part in creating public opinion.